Colombian born, Ricardo Gallo has been making waves on the American scene for a few years now. Since moving to US in the late nineties he has worked with such distinguished luminaries as Ray Anderson and Peter Evans. 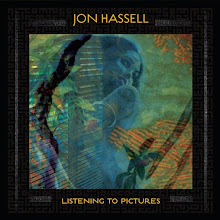 He has also recorded a stellar series of albums in duo, ensemble and group settings. His most exciting recordings for me have been with his formidable quartet. Gallo has well rounded and enterprising style that sizzles with each album he produces. While mixing avant garde tendencies and Latin American influences may sound frightening to the uninitiated, you may be very surprised by the results. They are always staggering and will undoubtedly convince you. With his third quartet release, Resistencias (Ladistrito Fonica), Gallo continues an amazing fusion of his Latin roots with contemporary jazz tradition. His long standing quartet featuring Juan Manuel Toro (bass), Juan David Castano (percussion) and Jorge Sepulveda (drums) deliver their best combination yet of Latin cultural aesthetic and post modern jazz. Beginning with "Bailemesta", a wonderful and vibrant piece that is set in the polyrhythmic Latin tradition but with superb improvised undertones. The percussion and drum work from Castano and Sepelveda on this opener is truly staggering. Gallo's writing continues to grow and become more complex as evident on "Auroa Parcial". "Auroa Pracial" is a melodic ballad which begins with a deep solo from Manuel Toro and seamlessly moves into avant garde territory with intricate work from Gallo at the piano. A hint of fun, adventure and might I say funk enters with "Kitchen Kuartet Kumbia" with Gallo playing melodica and Toro plucking away some rough basslines. It's as if Astor Piazzolla and Stanley Clarke were performing in your backyard (well maybe not but that was best I could think of at the moment). The percussion work from Castano and how Galo interacts on both "Kitchen Kuartet Kumbia" and "Iky" is mindblowing. This is definitely a group that has played together for quite some time and knows each other very well. Resistencias closes with "Viejo Presagio" a beautiful midtempo number that is almost anthematic in nature while softly leading the listener down from an exhilarating ride of Latin experimentalism. 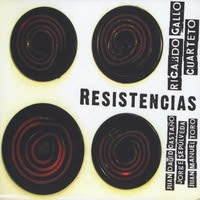 Resistencias states that Ricardo Gallo is an emerging artist/composer that should not be overlooked. This is one of the best Ricardo Gallo albums to date. It's a refreshing date and definitely worth your money if you are looking or something original and different to put on the stereo. Check out Downtown Music Gallery when you're finally ready buy this.